File image of a so-called "tech bus" parked in San Francisco. 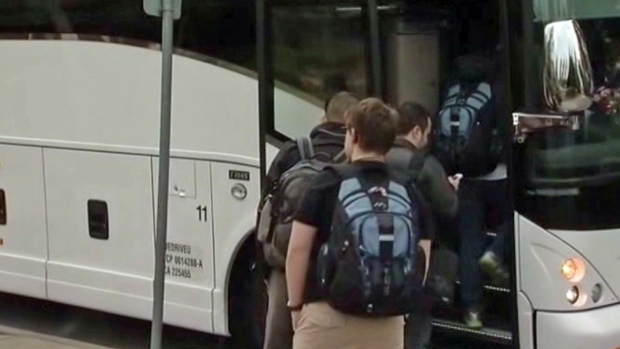 The San Francisco Municipal Transportation Agency Board of Directors voted Tuesday to make the controversial Commuter Shuttle Program permanent. Several Silicon Valley companies pay for the right to use bus stops to transport workers from the city. Critics of the program say it's causing housing prices to spike near shuttle stops. They also say the buses block traffic. Supporters say the buses cut down on traffic and pollution. In this edition of Reality Check, Sam Brock examines the claim tech companies are promoting environmental benefits with shuttle services for its employees. "The SFMTA’s 18-month pilot program has been a qualified success, removing thousands of cars from San Francisco’s streets during busy commute hours, reducing greenhouse gas emissions, and dramatically reducing disruption and conflicts with our Muni buses. The SFMTA, through extensive data collection and direct experience with drivers, passengers, neighbors and companies, has learned valuable lessons through the pilot, however, and has applied those lessons to the ongoing commuter shuttle program they approved today. "San Francisco and the Bay Area are growing in both residents and jobs, and that means more people commuting within, into and outside of our City every day. Even as we build thousands of new housing units and improve our public transportation infrastructure for the future, commuter shuttles will continue to be a vital provider within our City’s transportation infrastructure and they’re here to stay. With this improved commuter shuttle program that builds on the lessons and success of the pilot, we’ll have a cleaner fleet, less congestion, less disruption to Muni vehicles and our neighborhoods, with far more aggressive enforcement and full cost recovery from participating companies. I applaud the SFMTA’s important step toward creating an ongoing commuter shuttle program today."